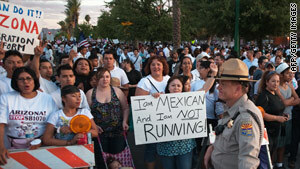 Demonstrators protest Arizona's new immigration law on Saturday in Phoenix. Washington (CNN) -- A Latino rights group and other immigrant and labor organizations called Thursday for a national boycott of Arizona over the state's new immigration law, which allows police to ask anyone for proof of legal U.S. residency. The call for a boycott was led by the National Council of La Raza, which bills itself as the largest national Hispanic civil rights and advocacy organization in the United States. Other organizations calling for the boycott include the Asian American Justice Center, the Center for Community Change, the League of United Latin American Citizens, the National Puerto Rican Coalition, the Service Employees International Union, the Leadership Conference on Civil and Human Rights, and the United Food and Commercial Workers union. The groups pledged not to hold major conventions, conferences or other special events involving significant travel to Arizona from out of state and "asked others to consider whether their purchases of goods and services might perpetuate the unjust and discriminatory law in Arizona," La Raza said on its website. "When a law so contrary to our values is passed, we must act decisively," said La Raza President and CEO Janet Murguia. "We are calling for a boycott because this law will blow open the door to increased racial profiling, wrongful arrests and other discrimination." Arizona Gov. Jan Brewer, who signed the immigration measure April 23, says it does not involve racial profiling or any other illegal acts. The law, known as SB 1070, is scheduled to go into effect this summer. Video: Emilio Estefan urges boycott of Ariz. The measure has drawn criticism in the United States and abroad. In Arizona, the Tucson and Flagstaff city councils voted this week to file suit against the measure. The city councils said they're taking action because of concerns over enforcement costs and negative effects on Arizona's tourism industry. In Tucson, council member Regina Romero introduced a motion for "the city attorney to bring a legal challenge" because the immigration bill is "unconstitutional" and "a bad law, which could cost the city millions of dollars in lawsuits." "This bill opens the door to racial profiling, and it puts Latinos in Arizona in automatic suspect mode," Romero said. Tucson Mayor Bob Walkup said up to 38 percent of retail sales in the city come from legal Mexican visitors. The state immigration law threatens Tucson's businesses, Walkup said, just when "the city is just beginning to recover from the economic downturn." Criticism also has come from abroad, with the Mexican government issuing an advisory to its citizens last week to avoid travel to Arizona. The Organization of American States expressed its concern about the law last week, and presidents of South American countries meeting in Argentina for a gathering of the Union of South American Nations condemned the law Tuesday. Well-known Mexican writer Carlos Fuentes recommended this week that dark-skinned people, men with mustaches, women who use shawls, or anyone who does not speak English well should not go to Arizona, because the state has "officially declared itself racist," the government-run Notimex news service reported Wednesday. The Phoenix Suns basketball team also criticized the new law, and wore jerseys marked "Los Suns" in Wednesday night's NBA playoff game against the San Antonio Spurs. "The frustration with the federal government's failure to deal with the issue of illegal immigration resulted in passage of a flawed state law," Suns managing partner Robert Sarver said in a statement. "However intended, the result of passing this law is that our basic principles of equal rights and protection under the law are being called into question, and Arizona's already struggling economy will suffer even further setbacks at a time when the state can ill-afford them." Arizona legislators say they passed the law because the federal government has failed to safeguard the border with Mexico, allowing more than 450,000 undocumented immigrants to settle in the state. On Thursday, Democratic Sen. Charles Schumer of New York wrote a letter to Brewer, asking Arizona to delay implementing the law for one year "in order to permit Congress sufficient time to enact comprehensive immigration reform to address Arizona's security needs."